How has Pentax gear aided your macro photography? What do you like about the cameras you use and why are they particularly suited to what you do? I do various very different types of macro, from studio and field focus stacking, to nighttime macro, to UV macro, to conventional butterfly-type macro. Each of these macro niches require different settings and different types of equipment, but the collection of Pentax bodies that I use all have various things in common that make this system great for me. the collection of Pentax bodies that I use all have various things in common that make this system great for me The bodies themselves are rock solid, made of metal, and weather resistant. Whether I’m running chasing butterflies or scrabbling about on the ground, I’m never worried about doing damage to the bodies. I’ve dropped them, scratched them, got them wet and knocked them against trees and rocks: no problem at all. My Pentax K-7 is a relatively older model now, and it lacks the high ISO performance of more modern DSLRs. This is ideal for AF160FC ringflash photography using Raynox diopters as this always and only uses ISO100. For stacking this is a great value model – the CMOS sensor gives lovely images at ISO 100, and the flash on the K-7 works with my Metz 58-AFII the way I’d like it to. pentax made a change on later models that makes rear synch with a Metz 58-AFII a tedious bodge. The Pentax K-5 has outstanding high ISO capability and I keep it ready for UV fluorescence macro. This uses UV torches, and with exposure times ranging from 5s to 30s, you need all the sensitivity to light that you can possibly muster. The K-5 shines in this department. The Pentax K-3II will be my goto camera for focus stacking and field macro when the season starts again in spring. The K-3II has an especially interesting new feature that makes it look like an excellent choice for natural light field stacking: pixel shifting, which combines 4 consecutive exposures to create a higher resolution image than would be possible with just 1. Pentax Pixel shifting isn’t appropriate for creatures on the move so I don’t see myself using this particular feature when I’m chasing butterflies next Spring. On the other hand, the higher processing power of the Pentax K-3II and therefore faster FPS means that it’ll still be the camera of choice for me for bracketing macro shots next spring. What lenses do you use for your shots? What do you like about them? The lenses that I use are very much dictated by the type of macro that I’m working on at the time. I do a lot of ringflash photography in the evening after dark and the sheer convenience of a kit 50-200 with Raynox diopters and a Pentax AF160FC ringflash on the end just can’t be beaten. The Pentax AF160FC has a great ‘modelling lights’ feature and these are great when it’s dark outside but you want to have some light to see what you’re doing. For conventional butterfly and dragonfly macro, I use a Tamron 70-200 f/2.8 Macro, with an extension tube. This is a great value lens that’ll give you pin sharp images with a lovely smooth bokeh. For stacking, I all sorts of optics, from microscope objectives at 10:1 to machine vision optics at 5:1 and various reversed 6 element enlarger lenses at 1:1-5:1. Enlarger lenses are optimised for flatfield performance and give superb resolution when reversed and used with bellows. Unlike modern optics, old lenses have a mechanical aperture ring, an absolute must when using a reversed lens. How do you focus in macro capture? Focusing is a real challenge in macro, and regardless of system, autofocus isn’t generally up to the job Focusing is a real challenge in macro, and regardless of system, autofocus isn’t generally up to the job. Whether it’s butterfly macro using a 70-200, or night macro using Raynox, I never use the focusing rings but instead move forward or backward for the shot, looking through the viewfinder for focus. When I’m out and about during the day I use a RRS BH-55 ballhead on the excellent Manfrotto 685B monopod, a combination which gives me access to a large variety of angles in minimum time. For stacking, the usual technique is to set the start of the stack by focusing in front of your subject, and the end of the stack behind the subject. Then you’ll need to work out what number of images to take in between, which depends on the magnification and f/stop of the lens that you are using. Finding a suitable end and start point is made very much easier by focus peaking, and with the K-3II having focus peaking in the camera, it looks like I can now leave behind the field monitor which used to do this for me previously. One less item to carry along is always good! Could you outline how you set up your camera to start shooting macro? How do you position it, what settings do you use, and do you make use of any accessories? 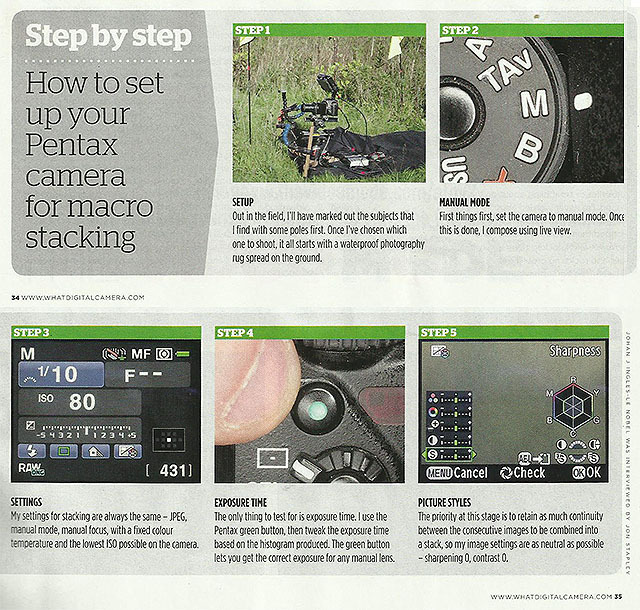 Setting up for a macro stack is a 10 minute process in the field, and involves a number of steps. Out in the field, I’ll have marked out the subjects that I find with some poles first. Once I’ve chosen which one to shoot, it all starts with a waterproof photography rug spread on the ground. Then I’ll get out the tripod – a wooden Stabil makro tripod which lets you get nice and low. I’ll spread out legs, mount the Stackshot electronic stage on the RRS ballhead, mount the bellows and camera on top and compose using live view. My settings for stacking are always the same – JPG, manual mode, manual focus, with a fixed colour temperature and the lowest ISO possible on the camera. The only thing to test for is exposure time. Typically I use the Pentax green button for this, and then tweak the exposure time based on the histogram that is produced. The Pentax green button is a really handy feature that lets you get the correct exposure for any manual lens. For the sake of stack processing speed I shoot JPGs rather than DNGs, and the priority at this stage is to retain as much continuity between the consecutive images to be combined into a stack, so my image settings are as neutral as possible – sharpening 0, contrast 0. Once I’ve got the settings and specimen right, the last thing to do is just to do a couple of testshots, one at both ends of the stack. This is to make sure that the full stack photographs well, and that there are no magnification issues at either end that might cause the stack to fail. It also lets me decide if I need additional lighting or a reflector. And, this lets me set start and endpoints on my electronic stage. With the start and endpoint defined, I calculate the number of steps that I need to make based on my f/stop and magnification, and set the stack on its way. The electronic stage then takes over and does as it’s told, moving the camera by increments measured in microns (1/1000 mm) to ensure a series of shots that can subsequently be stacked using stacking software. Are there any tips and tricks you can share with Pentax users to make their life shooting macro easier? It’s worth experimenting a bit with bokeh by using bracketing. Although f/2.8 might get you the smoothest bokeh, you might find that your butterfly’s wing is in better focus if you take the shot at f/5.6. It can be pretty frustrating chasing butterflies during the heat of the day when they’re at their most active. Morning and evening is when you’ll find them resting. Macro really does reward those who get out their bed at 5am in the summer. Noise is better than blur. Modern DSLRs perform remarkably well at ISO 800/ ISO 1600, don’t be afraid to go high. Use a hood, and check assiduously for stray light and light leaks in your bellows and extension tubes. Much of this is old equipment, and any stray light will show up as an dull grey extra that you don’t want. Always check front and back, switch off liveview during the stack and always, always make sure that you’ve got extra batteries along with you! There’s nothing more annoying that running out of juice halfway through a stack. Liveview consumes battery power like crazy so once you’ve done your checks, I switch it off. Very easy to forget. Aim for consistency between frames, set values manually, and avoid auto. By using auto, you let the camera decide settings, and this can introduce inconsistencies in a stack. For example on a 75 image stack, you don’t want a DSLR choosing different colour temperatures on the first 25 images to the rest. This can and does happen. For studio stacks, I like using three flashes on low manual power settings (ie 1/64). The short flash duration makes for sharp images, whereas using long exposures and continuous lighting can make for blurry images. Stacking is not a suitable pursuit for people in a hurry. A single stack can take hours to shoot, stack and post process. You mentioned the K-3 II — what has impressed you about the K-3 II in your time using it? Like many Pentax shooters I wasn’t sure whether to upgrade to the K-3II as I have a perfectly good K-5 body (k-5 released 2010) but when I started using the K-3ii I really noticed its beefier processing power and better autofocus. My K-5 occasionally waits to catch up the buffer when I’m taking multiple shot sequences, but even using DNGs I’ve never yet had the K-3 pause and queue on me. Autofocus too is a league better than on my old K-5. I’ve never used autofocus for macro because I’m much quicker doing this manually by adjusting body stance, but with a K-3ii and extension tube I’m almost finding the autofocus useful for macro. I still prefer manual, but it’s a much closer thing now and at least it’s a realistic option. Pixelshifting looks to be a nice feature, and in my experimentation it does indeed increase image resolution, a similar order of difference as taking an f/4 shot with a f/2.8 lens. The larger screen on the back is also a very nice improvement. Woo such a helpful blog filled with tons of useful information I am really thankful to weMacro where I found this blog link. I really want to thank Johan J Ingles-Le Nobel for making this blog Please keep up the good work going !! God Bless You ! !